« Why Did Yahoo Kill Its Podcast Portal? Did Microsoft Just Kill Apple TV? Today at DigitalLife, Microsoft made two announcements that raise the stakes in the competition to bring Internet television to the world. In doing so, Microsoft threatens to further marginalize Apple TV and even sideline indie video podcasters. Microsoft’s first announcement was to unveil Extenders for Microsoft Windows Media Center. These horribly named devices, which are expected to be available for purchase this holiday season, basically use your home network to bring premium cable, high-definition TV, popular video formats including DivX, music, paid movies and photos to your television. Several vendors have announced Extenders, and the Extender technology will be incorporated in HP‚Äôs current line of MediaSmart high-definition televisions. Microsoft also launched a beta test of Windows Media Center Internet TV, which will offer more than 100 hours of ad-supported entertainment from MSN Video, including full-length shows, music concerts and movie trailers. Microsoft’s focus appears to be on mainstream media content deals. While this holds the potential of offering a better out-of-the-box experience for general audiences, it could make it more difficult for indie video podcasters to compete for attention. Here are the details of the announcement….. According to Microsoft, watching a recorded TV show in the living room, pausing it, and then quickly resuming it from the bedroom or kitchen will soon become even easier with these new low-heat, quiet, home-theater devices. Extenders for Windows Media Center support streaming live high-definition TV, including premium cable channels in the United States, along with formats such as high-definition WMV. Devices from D-Link, HP and Linksys add built-in support for dual-band Wireless-N networking; and the D-Link and HP devices have expanded support for popular video formats such as DivX, XVid and H.264. These devices allow people to almost instantly start enjoying their entertainment ‚Äî there‚Äôs no need for a built-in hard drive to cache the video before viewing. New Extender devices are expected to be available this holiday season and will unleash photos, music, videos, and both live and recorded TV from PCs running Windows Media Center in Windows Vista for viewing and listening on big-screen TV displays or standard definition TVs, delivering the ultimate entertainment solution with a wide range of flexibility ‚Äî ready for today and the future. These Extenders will lead the industry in supporting the ability to send protected HD content to additional rooms, including recorded TV from over-the-air Advanced Television Systems Committee or Digital Cable tuners. Extenders also support on-demand broadband content from Media Center Online Media partners such as up-to-date sports reports from FOXSports.com, kids programming from Nickelodeon, downloadable TV episodes from Showtime Networks, and subscription movies on demand from Starz VONGO, along with support for a wealth of third-party plug-in applications. The Media Center Extender with DVD Player (DMA2200) from Linksys combines an upscaling DVD player with a dual-band Wireless-N Extender for Windows Media Center. It allows consumers to enhance their entertainment systems by teaming Extender for Media Center functionality with DVD playback capabilities in a single device. For consumers seeking a smaller form factor, Linksys will also offer the Media Center Extender (DMA2100), which delivers all the appealing features of Extender for Windows Media Center in a compact dual-band Wireless-N solution that is ideal for spaces, such as bedrooms, that call for a smaller device footprint. These new Linksys Media Center Extenders give consumers easy access to their HD television content, digital music and digital photos using just one remote control, and feature both digital and optical audio outputs that enable consumers to utilize their existing custom audio systems. They will be available for consumers to purchase in the U.S. this November at estimated street prices of $349.99 and $299.99, respectively. The D-Link DSM-750 MediaLounge HD Media Center Extender is housed in a sleek, 17-inch, black aluminum chassis, and connects to the home network using Ethernet or dual-band draft Wireless-N networking to make it easy to enjoy the Windows Media Center experience with friends and family on a home entertainment center. The DSM-750 lets customers enjoy HD videos with resolutions of up to 1080i; supports Windows Media Video (WMV), DivX, and XVid formats; and includes a USB 2.0 port for instant access to music, photos and videos stored on removable USB flash drives or hard drives. The suggested retail price for the device is $349.99 (U.S.). The HP MediaSmart LCD HDTV, currently available in 42-inch and 47-inch sizes, will support Extender for Windows Media Center technology through an optional software download, expected to be available in early 2008. The MediaSmart TVs support 1080p video, 802.11n wireless, and DivX, XVid, WMV and other video formats ‚Äî delivering all the compelling features of the Media Center Extender platform incorporated directly into a TV. 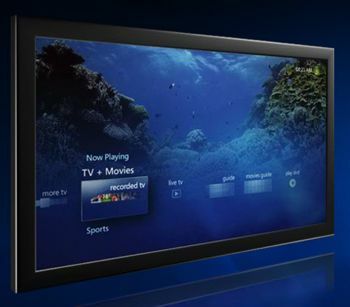 Although existing MediaSmart users can already access photos, music, videos and movies by simply connecting their TV to their wired or wireless home network, Media Extender functionality will provide them with a new set of enhanced features ‚Äî such as controlling live TV and accessing Windows Media Center Internet TV ‚Äî all easily accessible using their TV remote control. The HP MediaSmart TV is available in Best Buy stores nationwide, and through a wide range of audio/visual specialty stores throughout the country. Designed for the high-end home theater enthusiast, the Niveus Media Extender – EDGE offers a high-fidelity experience, uncompromised 1080p video, digital audio and the same amazing 3-D user interface found on the award-winning Niveus Media Center. Additionally, the Niveus Media Extender features the proprietary Niveus Glacier Passive Cooling System for cool and quiet performance and a sleek and stylish audio/visual form factor. The Niveus Media Extender – EDGE is expected to be available in early November. Pricing has not yet been announced. On the morning of Sept. 28, 2007, U.S. users of Windows Vista Home Premium edition and Windows Vista Ultimate edition will find a new feature inside Media Center: the beta release of Internet TV. This new feature will allow people to enjoy a range of television and video content on their PCs and TV sets without a TV tuner in their PC. This streaming video content will be supported by an advertising platform provided by YuMe and will be available to viewers for free. Internet TV has been designed for both the TV and PC screen, and features high-quality video optimized for broadband streaming. Viewers can enjoy these videos on Extenders for Windows Media Center, including Xbox 360 consoles, as well as PCs running Windows Media Center in Windows Vista (available in Windows Vista Home Premium and Ultimate). Yes, I want a device where the control is in someone else’s hands. Say hello to non-skipable ads, copyright infringement warning screens, tv shows that you can view today and can’t tomorrow and the blue screen of death! It’s Christmas-time for big media! Ummm… The AppleTV doesn’t require you to cache your movies before viewing them, but it allows it. It handles streaming beautifully. And I must say I personally like the idea of a hard drive, provided it can be replaced or upgraded. I like the ease at which you can get indie content onto Apple TV – but Apple has blundered by not letting you browse new content and control your subscriptions and purchases from the device. Also, in our experience with the Apple TV, streaming high-def content is very iffy. We’d like to see a DVD player on the Apple TV, too. I really like Apple TV, though. If they’d make the box easy to open up and upgrade, it would be even better. We’ve got the 40 gig model, which is sort of limiting. It would be nice to be able to easily crack it open and throw in a 500 gig drive.